China claimed 2nd victory of the championship by overpowering Philippines and finishing the game in 7th inning with the score of 16 – 0. Chinese Taipei beat Pakistan 15 – 0 at 7th inning. Philippine and Pakistan, will meet on December 2 to win the 5th place in the tournament. The 3rd game of Day 4 at the Intercontinental Stadium in Taichung, widely regarded as the virtual championship match between unbeaten Japan and Korea, was won by Japan 4-0. After pitcher Kentaro Yoshinaga (Waseda University) of Japan started with one two three, Hodaka Yamakawa (Fuji University) hit double and Yohei Kawato (Honda) hit a sacrifice to center field with runners on 2nd and 3rd with no out to score the first run in 2nd inning. On top of 3rd, Akira Matsumoto (J.R. East) got a run-scoring triple to deep center-right forcing K.T. Kim (Samsung Lions) to be replaced by D.W. Kim. A bloop single to center field with one out by Korea in the bottom of 5th brought Akira Akiyoshi (Panasonic) on the mound to replace Yoshinaga who pitched 4-1/3 scoreless strong inning with 2 hits and 3 strike outs. 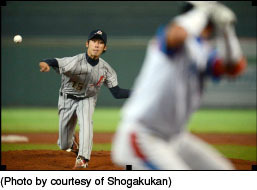 Reliever Akiyoshi did not allow any runner during his appearance till 1/3 of 9th inning to be closed by Junichi Katayama (J.R. East) leading Japan to 4th consecutive victory. Japan scored another run in 8th inning by Yamakawa hitting to the left field with runners on 1st and 3rd after one out. Takumi Horikoshi (Nippon Steel Sumitomo Kashima) hit double to score decisive 4th run on top of 9th inning.